As we transition towards a low carbon society, significant change will be required. Within this context, sustainable behaviour change has a major role to play and the thought leadership of NGOs will be critical. The Academy of Change is a new programme designed for 50 future leaders working on climate change and sustainability within the NGO sector. It will offer a unique professional development journey to help you build your skills in enabling more sustainable behaviour within your target groups, allowing you to integrate evidence-based knowledge about the underpinnings of behaviour into your strategies and projects. We understand the challenges around the implementation of behaviour change knowledge, and the role that tailor-made approaches and networks play as a decisive factor in replicating best practices, and encouraging interdisciplinary strategies focused on enabling more sustainable behaviours and lifestyles. Through the integration of behavioural insights into their projects and activities, NGOs have the opportunity to boost their impact within this realm. The programme is entirely free and will include training, webinars, coaching and networking opportunities with the other academy participants and high-level stakeholders. The programme is designed for professionals from NGOs dedicated to sustainability and climate change. 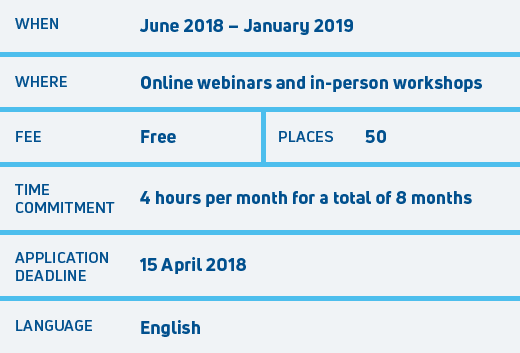 The programme consists of 6 modules that comprise strategic training, through in-person workshops and webinars, networking activities, and coaching sessions. Learning materials include explanatory videos and images, stories of real cases and assignments to support the application of programme learning in real projects. Go to our curriculum page to learn more about each module. The Academy of Change is run by CSCP and Behaviour Change, who will be delivering the content of the programme, and running the webinars, workshops and coaching. See more information about our team here. In addition, a line-up of keynote speakers, academics and experts will deliver insight through live webinars, videos, blogs and in person at workshops. Speakers will be announced and listed here shortly. Please sign up for our newsletter to keep up to date on all announcements. Results from the call for applications will be announced by mid-May 2018. All applicants will be notified of the results via email. The estimated time commitment is 4 hours per month. When applying to the Academy, you are committing to participating in all modules and to fulfil all assignments.